Officer's sash, Officer's and Other Rank's helmet. Major changes took place throughout the Army in the 1870s and 1980s, driven by the Secretary of War, Edward Cardwell. He abolished the purchasing of commissions and altered terms of service for both officers and soldiers. There were major changes for the Infantry and the future relationship with the County of Surrey developed. Cardwell divided the United Kingdom into sixty-six brigade sub-districts, each of which had a depot and two battalions, one of which would be abroad. In addition, various committees worked on strengthening territorial relationships. The Queen’s (Second) Royal Regiment of Foot had already formed a 2nd Battalion in 1857 and in 1881 they became the 1st and 2nd Battalions of The Queen’s (Royal West Surrey) Regiment. 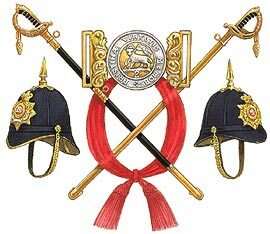 Also, in 1881 The 31st (Huntingdonshire) Regiment and The 70th (Surrey) Regiment became the 1st and 2nd Battalions of The East Surrey Regiment. The Home Service helmet had been introduced in 1878. It was made of cork and covered with blue cloth. Officers rank distinctions had changed in 1880 and were removed from the collar to twisted gold shoulder cords. Colonels now had a crown and two stars, lieutenant colonels a crown and one star, a major a crown, a captain two stars and a second lieutenant no stars. Their cuff lace varied according to rank.. Officers’ sword scabbards were changing from black leather to steel for all ranks, though field officers retained their brass scabbard. Other Ranks had a drastic change to their tunics following the Cardwell reforms of 1881. The various facing colours worn on collar and cuffs were changed to white for English regiments. For the Queen’s this was not too serious as Royal regiments retained their blue facings. However, the style of cuff and collar changed to a full coloured collar and a round ‘jampot’ cuff. There was white piping round the bottom of the collar and down the front of the tunic. The old ‘India’ style frock was replaced by a serge frock with seven buttons, similar to the tunic but without the front piping and with rounded skirts.